After the pics of the Danish sword, here's the Australian equivalent. that's a hell of a nasty looking bladed club, though I doubt it's a weapon as described, too unwieldy, more likely ceremonial. Also some fabulous Kimberly points below. Awesome, these things were glued with spinifex gum (a resinous plant burnt to get the goop and looks and works much like pitch pine glue), and bound with the sinue from kangaroo tails! I love these kimberly points, they do look beautiful and rather savage. Also most where made from the settlers' glass bottles and telegraph pole insulaters. 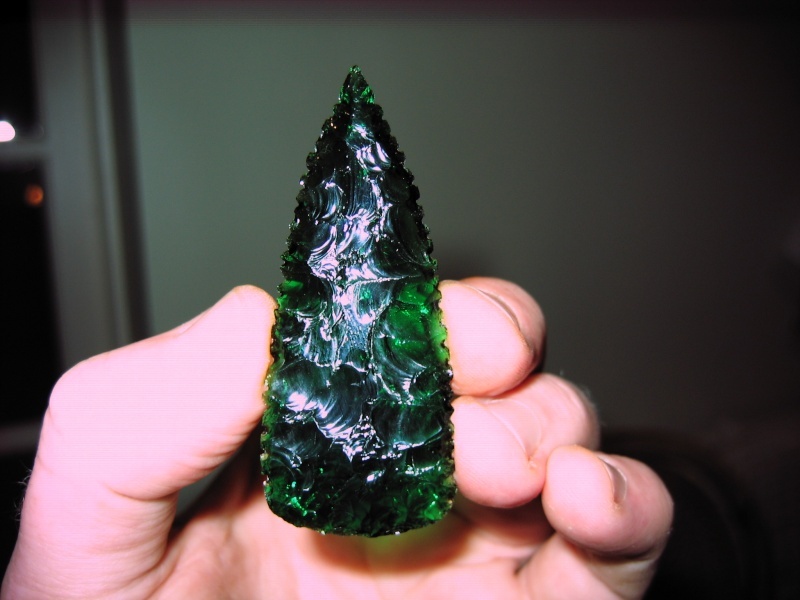 The aborigines had the same point shape for about 3000 years but they only had quartz to knap, the glass was really saught after. The only having quartz to knap makes you wonder if this was the reason they never really advanced unlike other cultures. Here is a Kimberly point I made back in spring out of stained glass, made another one (now sold) out of the side of a gordons gin bottle! Oop! Nearly forgot the Aborigines had silcrete and quartzite and some rough looking chert to knap too, not just quartz. I had to check my facts today! It is only the foreshaft, the rest would be about 10 ft plus in length and thrown with a woomera (spear thrower) to increase range. Now I really would not like to have that thrown at me! ooof.